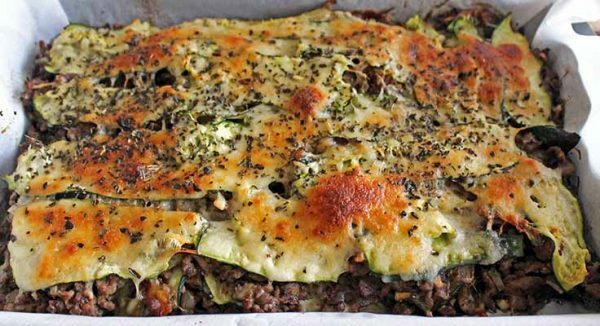 This Low Carb Zucchini Lasagna is a healthy and tasty alternative to normal lasagna. You don't need pasta or a heavy sauce for this delicious lasagna! Use a julienne peeler to cut the zucchini into ½-inch (1 cm) slices. Sprinkle lightly with salt and set aside for 10 minutes. Blot the zucchini slices with a paper towel and grill or broil them in the oven for 3 minutes at high heat. After broiling, place the zucchini on paper towels (you want to get as much of the liquid out as possible). Cut off the ends of the tomatoes and make an X insertion on top. Place in boiling water for a few minutes. Pour cold water over, and peel off the skin. Roughly chop onions, garlic, chili, peeled tomatoes, and mushrooms. Add a little cooking spray to a deep skillet and fry the garlic, onion and chili for 1 min. Add the tomatoes and mushrooms to the skillet and sauté the vegetables for an additional 4 minutes. Then take them off the heat and set aside. Cook the beef in the same skillet with the paprika until fully browned. Add the vegetables back into the skillet together with the chicken bouillon and remaining spices and let it simmer for 25 minutes over low heat. Take the lasagna out of the oven and allow to rest for 10 minutes before serving.